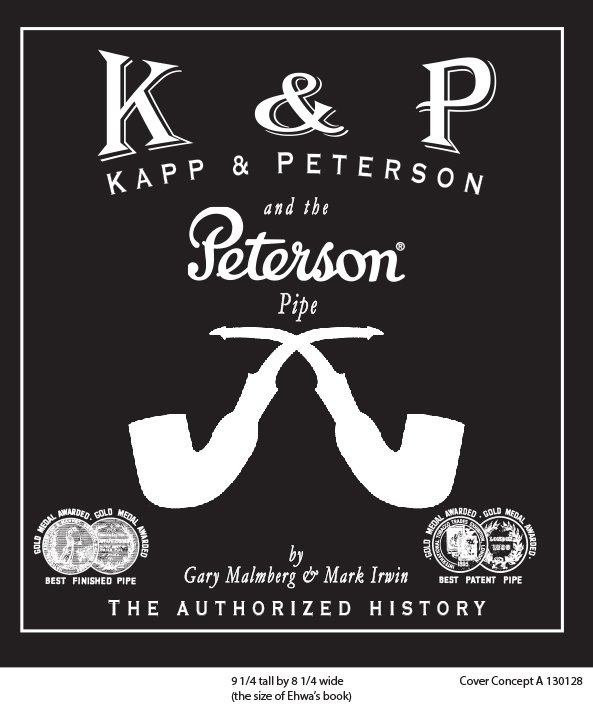 It’s beginning to look like 2017 will, at long last, be the year The Peterson Pipe: The Story of Kapp & Peterson will be published by Briar Books Press. As some of you know, we completed the second draft of the manuscript in March 2016, and then began what I thought were going to be the quick final stages of editing the manuscript from the publisher and dropping in the illustrations. That ended up being only half the story. What I didn’t know in March was that the vast archive of illustrations and photographs my co-author Gary Malmberg and I had created, when set next to the text, would necessitate a second “writing” of the book—not a verbal narrative this time, but a visual one illustrating the text. Each photo or engraving, I quickly discovered, needed to move the story forward. We agreed that this part of the book would be my journey, although Gary has been there at every step, giving advice, providing more illustrations if the ones to hand weren’t working, and serving as the best of sounding boards: “you’re totally full of s*it!” is a favorite among his refrains, and always perks me up when I’m down. Although we’d slotted as many illustrations as we could think of when writing the manuscript, sourcing them (“now where did I put that photo?”) and preparing them digitally (“this is going to need major surgery!”) has been a much lengthier process than I imagined. I call this “visual writing,” although it’s really digital darkroom stuff. One example: Gary provided some incredible photos of Peterson Boer War pipes, but how was the reader going to understand them, inasmuch as they’re covered with wrap-around hand-carved writing? In the end, the answer was fairly obvious—create an image showing both sides of the same pipe, with the front of the bowl placed above and between. And that was two evenings’ work. If you know much about writers’ habits, you know that most of them can only crank out the creative stuff for a few hours a day—even if they’re fortunate to have writing as their only job. Both Gary and I both have full-time day jobs—he in estate pipes, me as an English teacher. But given the nature of the writing game, we still turn in a full day’s time card most every day of the year. But the digital darkroom stuff is only part of what has kept pushing out the completion date. The other part involves the really the strange process of fitting illustrations to the written text. Sometimes there’s something missing (oops) or something that needs a tune-up (aargh). If you work on your car or do serious DIY work, you’ll know what I’m driving at here. I’ll give you two examples that cost quite a bit of time and effort, but were worth every minute. The first concerns Peterson’s industrial exhibition medals. 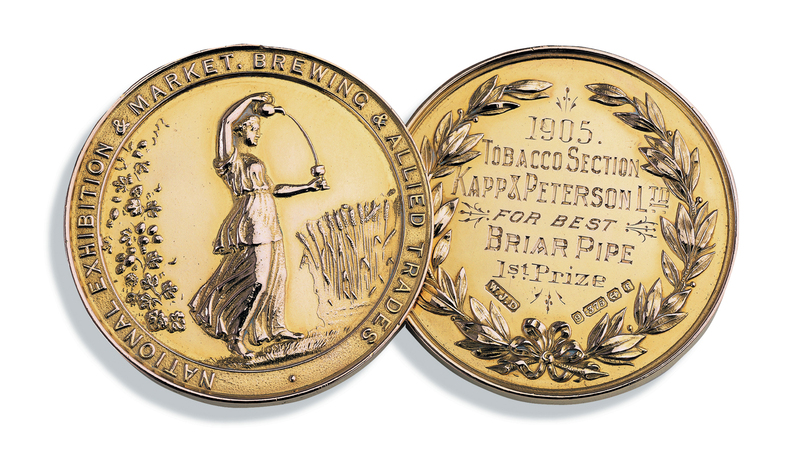 Exhibition medals were a big deal for any business wanting to promote itself from the 1870s through the 1910s or so, and I’m sure you’ve seen two of the medals Peterson still uses from time to time in its ephemera (those pictured above). The idea behind the industrial exhibition was to take a booth at one or another trade fair—sometimes regional, sometimes international in scope and attendance—and bring one’s product to be judged against similar products. The winners came away not merely with a medal, but with favorable reviews in the trade publications and often new contracts. K&P won two handfuls during a crucial time in its development. Gary had written this part of the manuscript, but in going over it for the 2nd edit, I was intrigued by just how many medals K&P had won. As we’ve done continually throughout our partnership, I double-checked his work (as he does mine), wanting to make sure the chronology was right and the facts documented. But it’s also my job to see that we have appropriate images to illustrate the story. The Peterson Museum had most, but not all of them, available for us to photograph back in 2013, but I couldn’t find a few. I spent about a week of my nightly Kapp Sessions doing research and finally came up with everything we needed, partially from evidence in the Peterson ephemera, but more from the fascinating trade exhibitions history of the period itself. Done, right? Well, no, because just last week while doing some digital restoration work on a catalog, I realized I’d just created the image I needed to open the medals section. And with that shock came another one, when I remembered a horrible bitmap image Angela Fortune had sent me way back in 2012, which in turn led to stitching together another small piece of this section’s narrative: it’s a photograph of Harry Kapp and his American distributor Leonard Rogers. Behind them over the mantelpiece in Harry’s office at the old Sallynoggin factory on St. Stephens Green are hanging–you guessed it–most (but not all) of K&P’s exhibition medals. So, done, right? Well, no, as it turned out. Pursuing another needed illustration, I had sent a string of emails sent across the Pond several months back about the “Francis Street Meerschaums”–the clay pipes made by the centuries-old community of Dublin clay pipe-makers who were effectively put out of business by K&P. In the course of my inquiries, one scholar suggested another and that one yet a third, leading eventually to conversations with folks at a certain English university. And that conversation, amazingly, led to the digital acquisition of Peterson’s earliest catalog. It turned out the catalog was printed in color, and being in color, led to new discoveries (“recoveries?”) about Peterson’s shape history. For me, it was an incredibly exciting moment in the detective work of the past five years. But it also meant going back to make more slight but important revisions in the text. Serenipity? Coincidence? Grace? Of course. And tucked away in all that business was one final revelatory item–and illustration–concerning the exhibition medals. Done? Done. Maybe. I hope. The same “three steps forward, one step back” process can be said of almost every part of the visual narrative, but it’s about 75% complete at this point. And that brings me to the book itself. As of this writing, the digital layout artist and I have come up with a large format book, about 11″ x 11″, double-column text, with smaller side columns to accommodate captions and other information. Full color (of course), in three parts: the history, the pipes, and the experience, plus three appendices—one on System pipes, one on catalogs, and the all-important reference guide. Seventeen chapters. Not to mention index, foreword, introduction, acknowledgements, and the rest. All of which to say: if we complete the layout and design by April or May, you can expect the book under your 2017 Christmas tree. And to answer one last question: why do I keep messing around with the Peterson Pipe Notes blog when I’ve got a book to finish? Good question, and the honest answer is that without the blog, I think I would have abandoned the book. The blog is really a stealth safety-valve. When I can’t process another image, write another caption, run down one more fact, or edit another word for the book, I take a few minutes to do something about Peterson I can share with fellow Pete Nuts right now just for the fun of it. The Original Web Poster from June, 2011. You have certainly piqued my interest, and continued to fan the flames of anticipation for the final release! My appreciation for Peterson pipes has grown through your blog as well. Write on! I’m looking forward to seeing the final product of your many years’ labour of love, Mark. It will undoubtedly be a great read! I sure hope so. C. S. Lewis said (somewhere) that we all write (or blog!) the books we want to read. That has certainly been the case for me with this one. I love the blog updates and small bits of information dropped over the past year. Some of those were quite helpful in my restoration blog entries for a few Peterson pipes I acquired. It is exciting to hear and see that you are rounding the bend and I can see how my 2017 holiday season will be spent once the book is released. I’ve already notified Santa! Thanks, Al. Your enthusiasm for the project has been a great help over the months! Can’t wait for this Book. Where to buy after release? Thanks for you work. Mu appreciated. Greetings from a german petenut. The book will be published by Briar Books Press here in the U.S., but Tom Palmer at Peterson has agreed to distribute it through Peterson’s network of distributors, which means you should be able to find it wherever you buy your Petes. It will be sold through Amazon (U.S.), Barns & Noble, and the Briar Books site as well. That’s great news! I’m so happy to hear that the book is in its final stages. 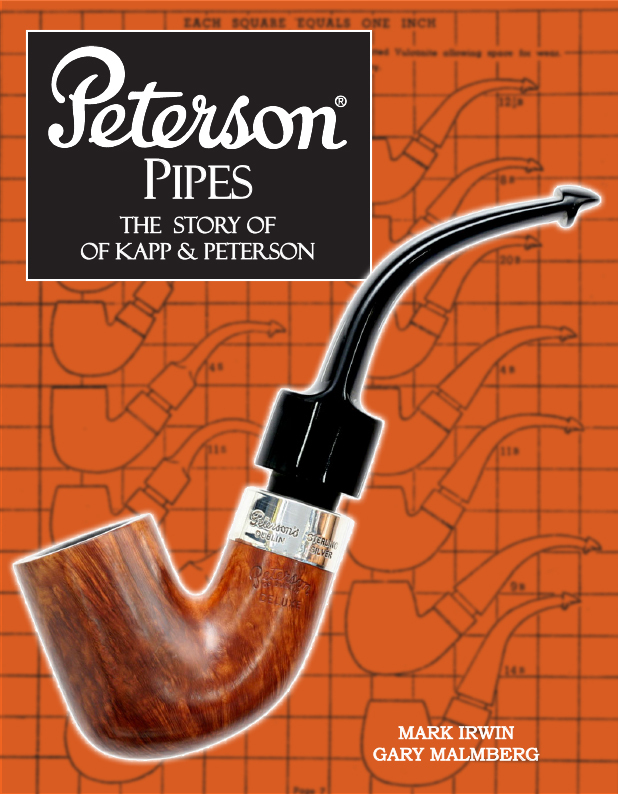 Are there plans for Peterson to bring out a special pipe to celebrate the release? That would be excellent! Also, I really enjoy your blog… I pray that it’ll continue after the book hits the shelves. Thanks, Jim. Yes, Tom Palmer has agreed to a special pipe. I’m calling it the “Story” pipe, but that’s all I can say for now. And yes, there is a lot we’ve learned about Peterson that can’t go in the book & I don’t like being any kind of gate-keeper, so the plan is to keep the blog moving into the future. I’m certainly looking forward to its publication! Great entry, Mark. I look forward to acquiring a copy of the Peterson history. Many thanks to you and Gary Malmberg for your dedication and perseverance on the book! Mark, Thank you for the update on the book. Please keep us Pete fans updated as information is made available. Looking forward to it! Thank you, sir. Should have more news in a few weeks. How great! I was really wondering if this would ever see the light of day as we have not heard anything for a long, long time. keep it going! I’m sure it will be dedicated to Jim Lilley whom we have lost just a couple of days ago. Hi Phil. That’s the first I heard of Jim’s passing. Thanks for the update. He was a wonderful guy and a giant in the world of Peterson. Yes, Jim was instrumental in getting the Peterson book off the ground, introducing me to both the late “Trucker” Chuck Wright and to my co-author Gary Malmberg. It was always great fun to read his blog and see what new pipes he’d added to his incredible collection. Hi Phil. I’m sad to hear the news of Jim’s passing. His wife had asked us not to contact him regarding the book quite some time ago, and of course we wanted to respect her wishes. I know all the guys at IPPC will miss him. As for the book, there’s actually been updates at the top of the blog on a regular basis. I’m working with the layout & design artist this weekend, as a matter of fact, who is getting a dedicated work station up and calibrated after looking at my illustrations and captions packages. She’s telling me she might be ready to send off the completed book to the publisher as early as the end of May — but we’ll see.